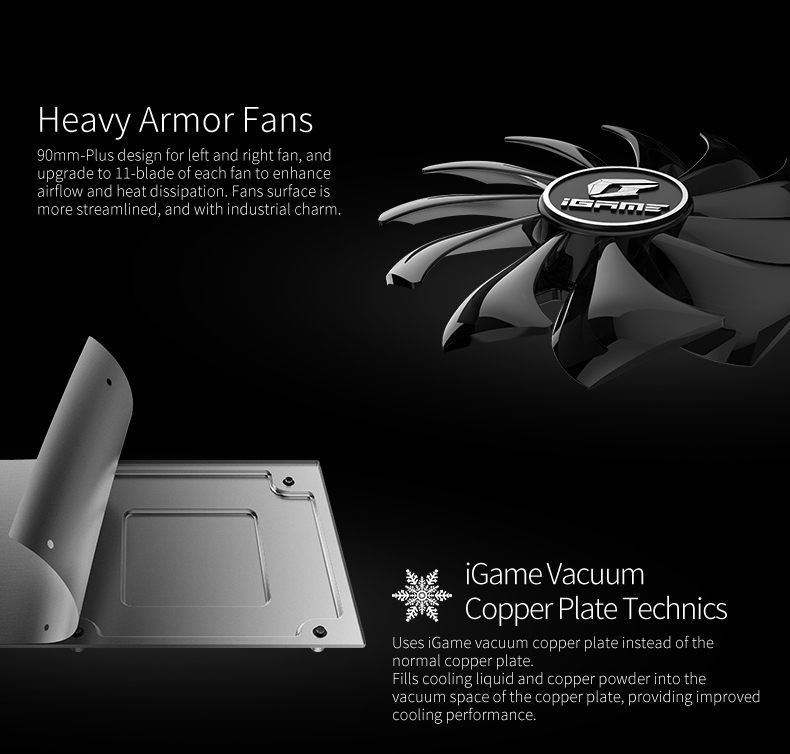 Colorful Technology Company Limited, professional manufacturer of graphics cards, motherboards and high-performance storage solutions, adds two new cards into its AD series, which were named as iGame GeForce RTX 2080 Ti Advanced OC and iGame GeForce RTX 2080 Advanced OC. The new GPUs were unveiled at a special NVIDIA two-day event called the "GeForce Gaming Celebration" which kicked off on August 20th at the Palladium in Cologne, Germany ahead of Gamescom 2018.
iGame GeForce RTX 2080 Advanced OC features Turing architecture and TU102 GPU. The 8 (11 for RTX 2080 Ti) GB GDDR6X memory is running with 448 GB/S memory bandwidth. This card features 8+2 (13+3 for RTX 2080 Ti) phase digital power supply via I.P.P (iGame Pure Power) and is equipped with Silver Sharp cooler as well as 16,8 million colors RGB lights on it. Customers can adjust its RGB lights via iGame ZoneII that can be downloaded from Colorful official website. Colorful upgrades Advanced armour this time for GeForce RTX 2080 Ti and RTX 2080 AD series with alloy casting technics to make it harder and seem more technical. For the cooling solution, Colorful takes vacuum copper plate for new AD series. The vacuum copper plate, highlights this release, is filled into cooling liquid and copper power to its vacuum space. This design is totally helpful for GPU heat sinking. Compared with normal copper plate, vacuum copper plate can do better to promote the heat loss. iGame GeForce RTX 2080 Ti Advanced OC and iGame GeForce RTX 2080 Advanced OC are going to be the good choice for high-end customers. "Colorful upgrades Advanced armour this time for GeForce RTX 2080 Ti and RTX 2080 AD series with alloy casting technics to make it harder and seem more technical. For the cooling solution, Colorful takes vacuum copper plate for new AD series. The vacuum copper plate, highlights this release, is filled into cooling liquid and copper power to its vacuum space. This design is totally helpful for GPU heat sinking. Compared with normal copper plate, vacuum copper plate can do better to promote the heat loss." Seriously, who writes this crap! That center ring intrigues me. Is vacuum copper plate a new fancy term for vapor chamber? Man I love all of Colourful's designs on their cards!!! I really hate how you guys are slacking off lately by not providing links to your sources of info. Especially when the info you've provided is as hard to comprehend as this. What the hell is copper power? Don't you mean copper powder? Like the way they make heat pipes, with the inner walls coated in sintered copper powder. Makes sense now. After searching for the product page myself, and finding what was lost in translation.